The huge cantilevered Chinese fishing nets that that droop towards the waters like over-sized hammocks have become a hallmark that represents Fort Kochi on the tourist map. Once just a fishing accessory, it is a now a big bait for tourists. Chinese fishing nets - Cheenavala in Malayalam - is believed to have been introduced in Kochi by Chinese explorer Zheng He, from the court of the Kubla Khan. 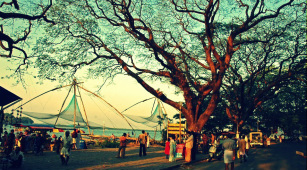 The fishing net established itself on the Kochi shores between 1350 and 1450 AD. The Chinese nets, made of teak wood and bamboo poles, work on the principle of balance. Each structure, about 10m high, is fixed on the beach and has a cantilever with an attached net that is spread over an area of about 20 meters. Counterweights, usually stones about 30 cm in diameter, tied to ropes of different lengths, facilitate the working of the nets. Often, lights, attached to the teak posts. are suspended above the net to attract fish. Each fishing net is operated by more than four fishermen and is made in such a way that the weight of a man walking on the main plank is enough to cause the equipment to be pulled down into the sea. Fishing is usually done in the morning and early evening. The net is descended into the water for a short time and then raised delicately by pulling on the ropes. The slow rhythm and balancing of the net is spellbinding to a first-time viewer.